Which Markers Work Best With Rubber Stamps? Stamps are popular tools for making cards, scrapbooks and a myriad of other crafts. Stamps do not have to be one solid color, but you can be color them in with several colors or with added details using markers and marker pens. Markers will work alone or with stamp ink pads, both creating different techniques. The markers used for stamps can be water or alcohol-based, have different tips and can be used in many ways. Water-based markers work most effectively on the stamp itself. Water-based ink dries slowly and thus is easier to clean and alter with effects. Even after drying the ink, you can wet it again with water and blend it with a paint brush or blender pen. Alcohol-based markers also work with rubber stamps but could potentially stain the rubber if not cleaned immediately after using. The alcohol-based ink dries quickly and is permanent on paper. You can remove this type of ink by applying stamp cleaner or hot soapy water. Markers used for stamping and other art projects can have dual, dabber, fine or brush tips. Dual tipped markers have a fine and thick or an angled and brush tip, designed to provide both broad and narrow portion control with a flip of the marker. Dual markers can also include a dabber on one side. 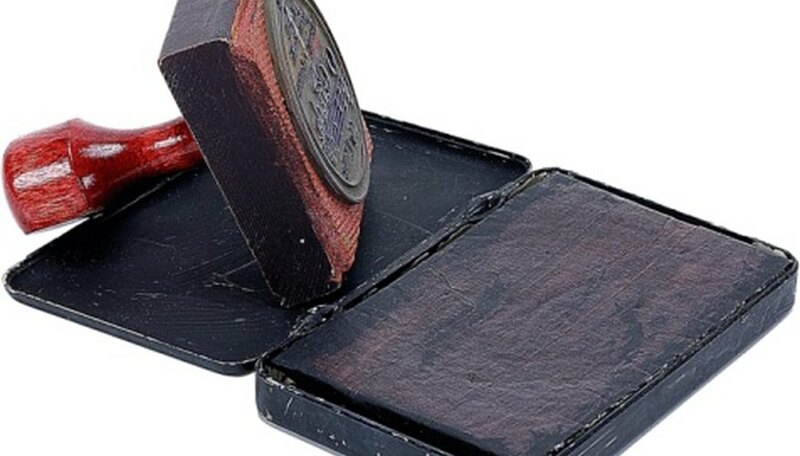 The dabber acts like a small, controllable ink pad as you can place larger amounts of ink on the stamp at one time. Thin markers used for stamping tend to come with a tip that is thicker at the base but becomes thinner at the point. This is helpful because, while turned on its side, the marker will produce thicker lines, but when held straight up and down will produce a thin line on the stamp or paper. Fine tips are also called marker pens because they are so thin, used for precise detail. Brush tips are the most commonly used tips for stamping. A brush tip, usually made of fiber, acts like a paintbrush, allowing for both detail work and quick covering. This style also delivers ink in a consistent manner. Brush tip markers that can be filled with water are called blender pens, made to use with ink or watercolor paints to create watercolor effects. You can apply black ink to the outline of the stamp with either a stamp pad or marker, then, after you stamp it, you can color the image with any marker. Another technique involves coloring in the stamp with specific colors and stamping the design onto the paper. You can then add more colors to the image. Markers are also beneficial as you can choose to color specific areas of the stamp and leave certain designs that are on the stamp out of your final image. You can use any water-based marker on stamps, and often the package will include what materials or art projects with which you can use the markers. Alcohol-based inks will work, but the ink dries faster and is permanent, so take care. Copic markers have two tips and alcohol-base ink, and they are available in four varieties -- Copic, Sketch, Ciao and Wide -- and come in hundreds of colors with replaceable nibs and refillable ink. Inkadinkado brand sells dual-tipped markers with a dabber and fine point in primary, pastel, metallic and earth tones, all water-based. Marvy brand markers are water-based and easy to blend. The brush markers have over 100 colors available in pastel, primary and themed sets. Stampin’ Up! sells water-based markers specifically made for rubber stamping. The markers come in many colors, have finger grips and easily removable caps and are odorless. All of these brands’ markers are non-toxic and are available at an arts and crafts store or on each brand’s website. How Are Washable Markers Different From Permanent?